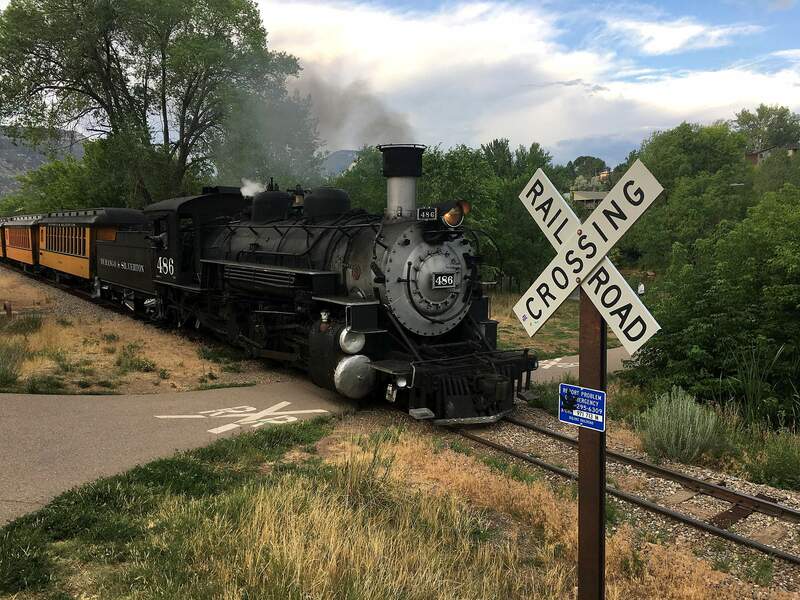 A Durango & Silverton Narrow Gauge Railroad train returns to Durango from Silverton on Tuesday evening. A coal-burning locomotive pulling a full load of passengers left the Durango and Silverton Narrow Gauge Railroad Station at 9 on Thursday morning for Silverton, where passengers were likely greeted with open arms during their approximately two-hour stay as they had lunch and picked up souvenirs. Since the start of the 416 Fire on June 1, Silverton – and Durango – have been without the critical economic fuel which train passengers provide. The summer tourism season is already short without having to give up 10 days. Rain, even small amounts on a few occasions, has mostly dampened what was the 50,000-acre fire and created a less combustible forest floor. Firefighters, after bracketing the fire and protecting structures, have left the fire to burn itself out to the north and northwest. While investigators have not yet issued a report citing the cause of the fire, given where it broke out it most likely was caused by the train. La Plata County Commissioners on Wednesday reduced their estimation of the degree of fire danger by one step, from Stage 3 to 2. That gave the D&SNGRR the window it needed to decide to begin operating again, however cautiously. The small motorized pop car and trailer with firefighting equipment followed the train, as it always does during the train’s busy season. Catching spark-caused fires quickly is critical. After running for a few days, train officials will have a good sense of the degree of fire danger which remains. Railroad owner Al Harper has been emotionally devastated by the fire and has said that he will do his best to not put the health of the forest, the economies of Durango and Silverton and the company and its employees in this position again. Harper is arranging to acquire and rebuild two diesel locomotives with adequate power to pull full trains during the driest conditions and to retrofit an existing locomotive to run on oil, which produces far fewer errant sparks. Those substantial additions will not be available until after this season. In the meantime, it is appropriate that weather conditions dictate train operations. July rains and higher humidity seem to be here, which even in small amounts are critical. August is traditionally hot, with temperatures cooling early in September and a better likelihood of rain. But, a warming planet is expected to be unpredictable, bringing extremes at unusual times. Southwest Colorado’s dry climate even in the best of times requires judgment as to what possibly fire-causing outdoor activities are appropriate. Even with the future addition of an oil-fired locomotive and diesels there will be judgment calls as to when their greater safety is needed. It is good to have the Durango & Silverton Narrow Gauge running again, and after the 416 Fire we can expect everyone to be extra vigilant as to weather conditions.